Please note: This list is just a start and we will keep adding to it! If you would like to add your service to the list please contact us. Thank you! Provides a point of contact for crime victims and their families who have concerns related to offenders who are in the custody or under the probation and/or parole supervision of the New Mexico Corrections Department. It also provides comprehensive information, assistance and support to crime victims and their families. Provides education and enforcement of crime victims' constitutional rights for all victims of violent crime. Their goal is to help victims meet their legal, financial and emotional needs. Assists victims of violent crime with expenses incurred as a result of their victimization. 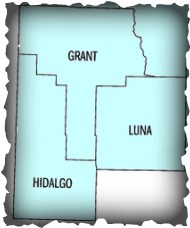 Provides services to survivors of sexual violence in Grant County & Hidalgo County, New Mexico. Helps people begin their process of healing by alleviating the numerous financial demands faced by victims and their families, including funding related to attending the court proceedings such as lost wages, child care, or travel expenses when needed. Serves victims in South Western New Mexico and South Eastern Arizona. Gila Regional's Sexual Assault Nurse Examiner Program is driven by registered nurses who are specially trained to provide around the clock, first-response care to sexual assault survivors. Offers education, counseling, a shelter for victims of domestic violence, legal services for children and their families effected by domestic violence and sexual abuse. Provides service and specialized assessment, mental health evaluations, support services, counseling, education and training, life and social skills, crisis intervention, and domestic violence shelter care. Civil legal advocacy organization dedicated to equal access to justice for all low-income people and communities throughout New Mexico by providing help with civil legal issues through outreach, training, education, and quality representation. Legal information (not advice) regarding domestic violence, sexual assault, and stalking.